Situated at far west of inland Tibet, Mt Kailash is not so easily reach. But every year thousands of Buddhists, Hindus, and tourists travel to Mt Kailash. Because it is the most sacred peak in all of Tibet, and possibly all Asia. Tibet Travel Expert of Tibet Ctrip Travel Service Team shares here how to reach Mt Kailash from Lhasa and Kathmandu, two most popular and doable travel routes. 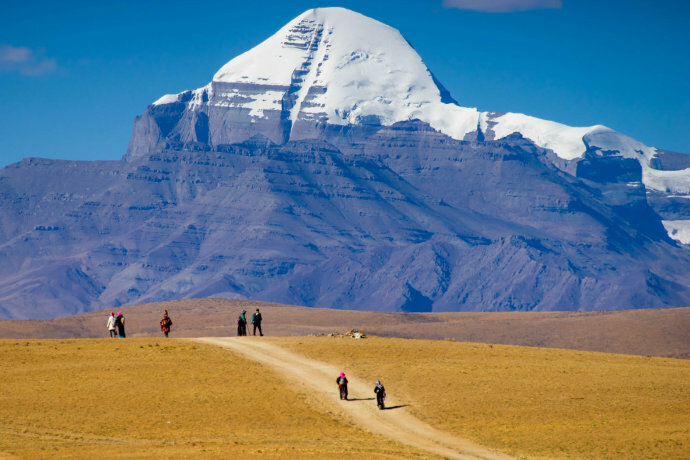 Mt Kailash is famous for the 52-kilometer pilgrimage circuit around the mountain. Where in the Buddhists and Hindus believe that the sight of the peak will wash away sins of a lifetime. According to mythology, Mt Kailash is the home of Shiva, a prominent deity in Hinduism. Mt Kailash is neither too high to cause altitude sickness nor too low with a dull scenic view. Instead, it has the perfect height of 22,027 feet which makes it for a fantastic experience and view. There are four of the most important rivers flowing near Mt Kailash which makes it a wonder by itself, namely, the Indus, the Brahmaputra, the Sutlej and the Karnali. To reach Mt Kailash from Lhasa is the most popular travel route. Most travelers choose this route for it is the safest and most reasonable one. It is a well-paved road which is from the west of Lhasa straight to Kailash, via the striking towns of Shigatse, Lhatse, Saga, and Paryang. The route from Lhasa to Kailash is the most preferred as it increases with altitude gradually. We recommend that travelers spend 3 nights in Lhasa, 1 night in Gyantse, 1 night in Shigatse and a further 4 nights between Shigatse and Darchen before heading to the highlands of Mt Kailash. This will inhibit the complications of high altitude which could end up being very severe and mess up your amazing adventure. One can also travel overland to reach Mt Kailash from Kathmandu via Gyirong Port. Gyirong Port is the new Sino-Nepal border, has reopened to international tourists by the end of Aug. 2017. It is a bit dangerous to take this route as it suddenly increases to higher levels of altitude. The route follows Kathmandu which is already 1350 meters above, to the Nepal-Tibet border which is 2300 meters, following on to the town of Saga or Paryang which is at a height 4600 meters. This happens in a short span of 3 days, which is too short a time when trying to get the body adjusted to high altitudes. If you decided to reach Mt Kailash from Kathmandu, we suggest you take an additional rest day in Gyirong town. Tibet Travel Expert of Tibet Ctrip Travel Service Team is experienced in arranging Mt Kailash tours with or without kora. Please get in touch with us via email, [email protected], to find out more insider tips.